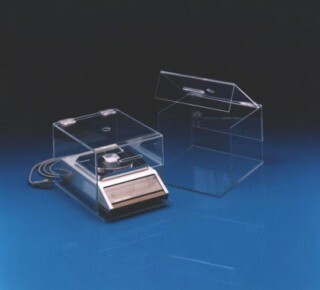 These guards are designed to protect samples on Balances during weighing. They enclose the balances, leaving the controls exposed for easy access. A hinged lid offers direct access to the weighing pan. A 1" hole on the top of the lid allows for sample dispensing. This guard is designed for use with Sartorius Balances with a housing of 2-1/2" high x 8-5/8" wide x 11-1/8" deep and equivalently sized electronic balances.